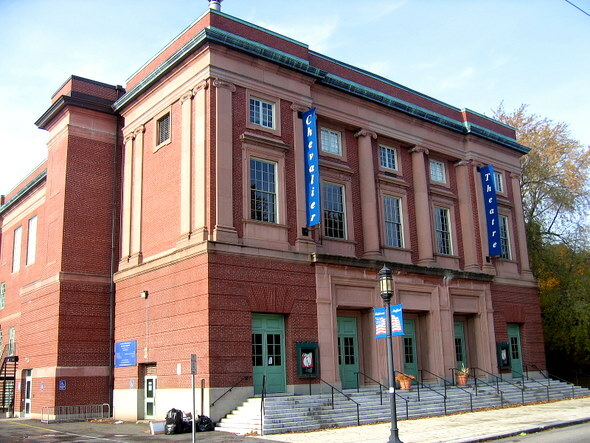 Friends of Chevalier Auditorium and Gene Mack Gym is a nonprofit organization dedicated to fostering financial and community support and being an advocate for the historic theater and gymnasium in Medford, Mass. Through promotion of cultural, theatrical, civic, and youth programs, the Friends strive to enrich the quality of life in the community. Over the past 25 years, through fundraising efforts and hands-on volunteering, the Friends have performed or paid for physical improvements to the facilities; sponsored free community concerts and other fund-raising events at the theatre; and worked with the Mayor and City Council to bring the youth center to fruition in 2001. All told, the Friends have raised nearly $600,000 in support of Chevalier Auditorium and the Gene Mack Gym, now home of the Medford Youth Center (formerly the Medford Boys & Girls Club) and the Medford Recreation Department. In 2014, the Friends obtained a $100,000 grant for the Medford Boys & Girls Club through the Cummings Foundation’s $100k for 100 program, to expand staffing, membership capacity and educational programs, and in 2018 the Friends received a $250,000 grant from the Cummings Foundation’s Sustaining Grants program. Chevalier Theatre is a historic landmark and cultural treasure in the heart of Medford Square. Formerly the auditorium for Medford High School, the theatre has a Greek Revival style exterior with Art Deco interior details, including a double elliptical ceiling. Its gently curved interior walls provide excellent acoustics. Chevalier is the sixth-largest stage theater in the Boston area with a seating capacity of 1,856. It was dedicated on March 7, 1940 to Medford High School graduate Godfrey Chevalier, a pioneering World War I-era Navy aviator. Currently operated by Bill Blumenriech Presents, Chevalier Theatre features a wide ranges of programs from concert to comedy, and politics to podcasts. Lieutenant Commander Godfrey DeCourcelles Chevalier was a pioneering aviator of the United States Navy of World War I and the early 1920s. Born in Providence, Rhode Island, Chevalier grew up in Medford and was a standout athlete at Medford High School. On Oct. 1, 1910, Midshipman Chevalier performed the first of what would be several heroic feats, rescuing some 20 sailors tossed from an overturned barge in New York’s Hudson River. Two years later, Chevalier was with the first detachment to land in France on the USS Neptune. He became the commanding officer of the U.S. Naval Air Station at Dunkirk, France, in 1917-18 and was awarded the French Legion of Honor and the Distinguished Service Cross for his extraordinary meritorious service. In 1922, Lieutenant Commander Chevalier made aviation history, becoming the first U.S. Naval aviator to land an airplane on a moving ship, the USS Langley. Tragically, Chevalier’s life was cut short less than a month after his historic flight, when he died from injuries suffered in a plane crash in Virginia. 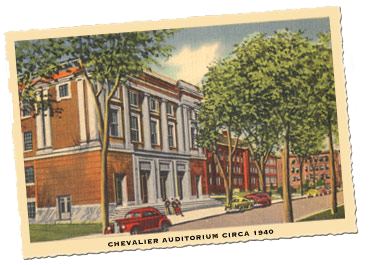 Chevalier Auditorium was dedicated to his memory on March 7, 1940, which would have been his 51st birthday. The Gene Mack Gymnasium, located on the lower level of the auditorium building, is now home to the Medfor Youth Center operated by the Malden YMCA. 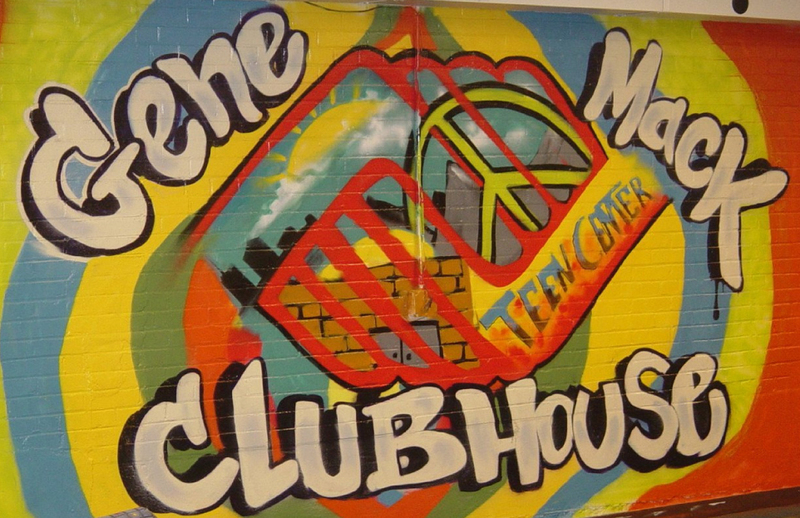 The youth center offers children ages 6-14 recreational and educational programs including sports activities, tutoring, computer training, homework help and mentoring.